SWITCH will be working with NPR (Neighborhood Public Radio) to broadcast their own daily news show throughout the week of ZeroOne San Jose/ISEA2006. Below is a brief introduction to NPR. Our motto: If it’s in the neighborhood and it makes noise .. we hope to put it on the air. At few times in recent history has it been more imperative that communities find ways to make their voices heard. As the FCC attempts to make it easier for radio stations to be co-opted by large corporations, and as the Corporation that runs our one National "Public" radio outlet conspires to exclude all other voices from the left end of the radio dial, individuals in the Bay Area are making it known that they will not be restricted from accessing the airwaves that are rightfully their own . 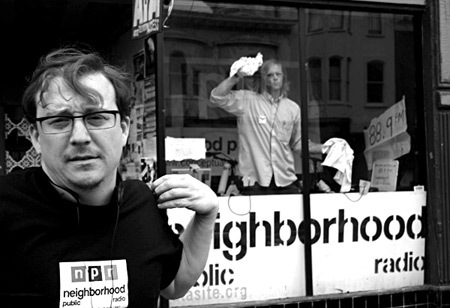 Neighborhood Public Radio has been named "Best Super Local Radio Station" by San Francisco magazine and we have been featured in Punk Planet magazine, Artforum, and the Chicago Reader. As a traveling band of guerilla broadcasters, folks from NPR have hosted thematic broadcasts far and wide, including both Artist’s Television Access and Southern Exposure Gallery in San Francisco’s Mission District, Chicago’s Version 5 Festival, and a recent trip to collaborate with the neighborly media folks of kuda.org in Novi Sad, Serbia (a trip made possible by a grant from CEC Artslink). Visit our blog to read all about NPR’s adventures across Europe during Summer 2005. We try to document as much of the environment of any event we are at, while simultaneously bringing in other groups that might not have seemed a natural part of the larger event, and provide a framework for them to be expressive without the direct sanction of the larger group. We hope this results in some expanded perspectives on both sides, the communities on our airwaves have a direct experience of a venue that may have previously seemed closed to them, usually for social reasons, and these apparently “closed” venues confront their status as public spaces. Anytime we set up a couple of microphones, some CD players and a mixing board and ask people to fill up time with them we automatically set up a dialectical web that becomes it’s own exciting community. The community survives as the recordings we make of the event, but these recordings are of course merely documentation. We always emphasize the importance of live events and present our studio as an installation whenever we set-up in an art space. Whether it’s an art gallery, a theater ticket booth, or a Spanish castle, it is vitally important that the space we are in is activated and changed by the broadcast that is occurring in it. We try to nomadically create what Hakim Bey infamously called a Temporary Autonomous Zone. What’s really scary about that, especially here in the states, is that, in so doing, we are “creating temporary space that eludes formal structures of control”.. in a space that is supposed to be “publicly owned” - the radio airwaves.